What do you get when you raise skin cancer awareness in London with bikini-clad models bronzed with Tanorganic and torrential rain? Huffington Post’s 2nd Best Image from Around the World of course!! 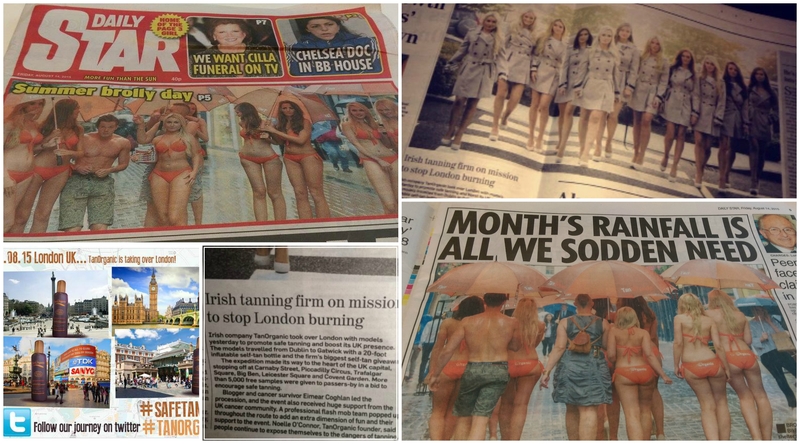 One month of rain bucketed down in just a few hours, you’d expect this to be worst weather to promote an all-natural and organic fake tan and a #safetanning campaign but it was thanks to the rain that our campaign trended 3rd on UK twitter and our photos made it into coveted UK newspapers, both online and print! No matter how cloudy and rainy it is, UVA rays are always present. It gives a new meaning to Tanning in the Rain! 11 beautiful Irish models from Assets Models and Miss Ireland Bikini, Judy Fitzgerald, flew over from Dublin to London in their bikinis. I met them in Victoria Station to lead the #safetanning skin cancer awareness campaign into the heart of London. With the world’s tallest fake tan bottle and a dance mob in tow, it turned out to be quite the adventure! Tube ride from Victoria to Oxford Circus. I’m at the back left. Commuters got an unexpected surprise on their tube journey! Rain and umbrellas added another dimension to the amazing dance mob in Piccadilly Circus, then the sun came out to cheer them on in Leicester Square! 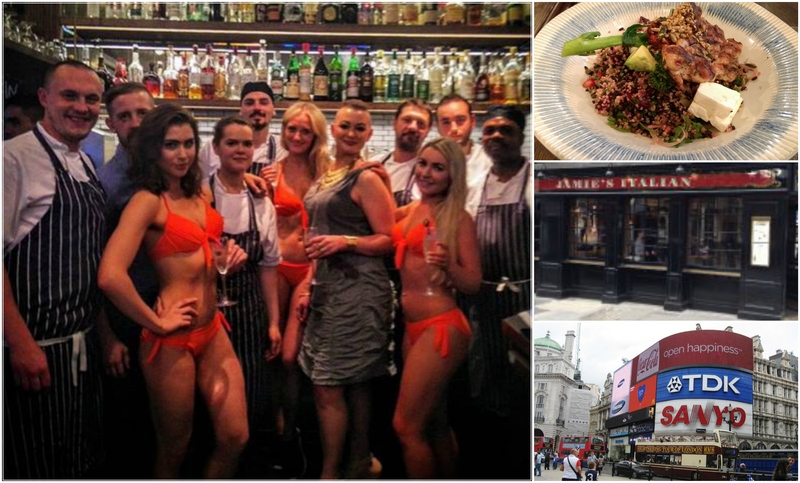 Jamie’s Italian Restaurant in Piccadilly Circus invited us all in for a well deserved lunch to refuel. Pictured here with the Head Chef and kitchen staff. I had the best Superfood Salad with chicken and feta, a salad that’s healthy and truly fills you up. Superb!! Under pouring rain in Carnaby Street and the belting sunshine in Leicester Square, the UVA rays are always there. The best anti-aging cream you can put on is SPF! Having lived in Rome, Italy for 4 years, I have always been really passionate about the importance of protecting your skin from the sun. Not only to prevent skin cancer but to stop premature aging. Yes a tan looks nice, but ending up like a prune isn’t! I liken tanning in the sun to putting a piece of bread into a toaster, over time your skin will become dry and shriveled up just like a piece of toast. Wear SPF and get your tan from a bottle instead. Everyone knows that the pink ribbon is for breast cancer, but did you know that the black ribbon is for skin cancer? Towards the end of the day, it was time for the models to kick off their high heels and relax! After a long day pounding the London pavements and having said goodbye to the models, the Tanorganic Team and I had dinner in Bubba Gump Shrimp restaurant near Leicester Square. An all Forest Gump themed restaurant! The shrimp linguine was the best I had ever tasted! 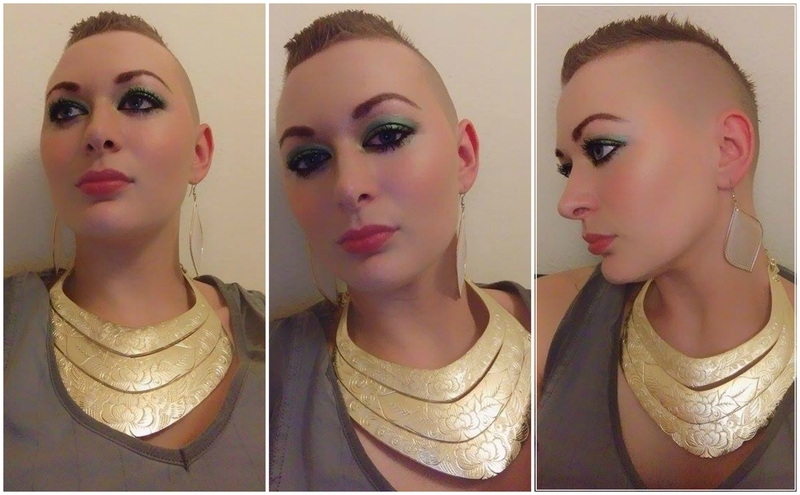 The dress (from TK Max) was pretty plain until I added a man’s belt from Primark (Pennys) and stand out accessories. My earrings are from Clare’s Accessories. Previous Post Chemospiration, Wexford and Sunshine! Congrats for the job well done.